You are currently browsing the archives for the MVP Program category. I would like to congratulate 4 of our Authors for being re-awarded their MVP status. These 4 people are active beta testers and always strive to be the best at what they do! I, on behalf of MSBLOG would like to extend a big congratulations to our very own Daniel Lai-This years first MVP insider for 2007. Daniel is frequently writing Knowledge Base (KB) articles for Microsoft, participating in beta & public News Groups and being an all round mentor to Microsoft beta testers in general. On a side note, I would also like to congratulate another MSBLOG author, Joseph Bittman AND Jabez GanÂ for being re-awarded MVP status inÂ their work in the DPM/Windows ServerÂ fieldÂ for another year. 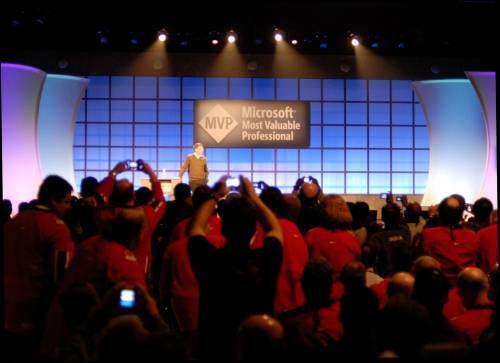 One week after it named the creator of a Windows Messenger add-on to its list of Most Valued Professionals (MVPs), Microsoft has revoked the award.Â The news spurred criticism from fellow MVPs and the Windows Live CommunityÂ due to Patchou’s Messenger Plus product being bundled with an optional adware. Patchou’s popularity grew after he created Messenger Plus, a free program that adds some useful functions to Microsoftâ€™s instant-messaging software (Windows Live Messenger), like the ability to stack several chat windows together and access them via tabs. He was nominated and then last week, Microsoft named Cyril Paciullo, the creator of Messenger Plus and Messenger Plus Live, to its list of MVPs. The award recognizes people with expertise in Microsoft products who make significant contributions to other users, often in the form of technical advice. Microsoft today issued the following statement: “Cyril Paciullo was awarded with MVP status this year on the basis of his technical expertise and strong community contribution. However, his active MVP Award status was revoked as soon as the extent of the connection between his application and spyware was made apparent to the MVP Program.“. While one could easily understand the company’s reaction in this matter, the very fact that Patchou was awarded the MVP award in the first place proves that Microsoft has acknowledged his extraordinary product expertise and significant contribution to the MSN Messenger and Windows Live Messenger, now and in the past. Once again it’s been proven that all the criticism regarding the optional adware doesn’t devalue the quality of the addon in the eyes of its millions of users and those millions of users cant be wrong. I can see where people are coming from complaining but in my honest opinion it dosen’t really matter. Our very own Daniel Lai from MSBLOG was just awarded the “MVP Best Practice Of The Month” Award for hisÂ Training Guide onÂ Business Desktop Deployment 2007. We here at MSBLOG areÂ proud to haveÂ aÂ goodÂ friend such as Daniel who strives to be the best…For that we congratulate him-Well Done Daniel and keep em coming! Q20: Why must Microsoft MVPs be 18 years or older? April 2006 affirm that they are 18 years or older. Q21: What if I am a current MVP and I am younger than 18 years old? be considered for re-award in subsequent MVP Program award cycles. deep disappointment, although I’m sure most people at least slightly “understand”. re-awarded. . . . Which I personally am glad, as I definitely am under 18 years old.